More exciting than the surface of the city itself can often times be perhaps a city’s underground, that vast dark reciprocal hollowed space that some how helps prop up everything above it, a colossal settlement, a global city. I’m always blown away thinking about how so much urban weight can rest on essentially a tangled network of constructed voids, or an infrastructure of more or less empty space. Much of what we can’t see in a city is what sometimes fascinates me the most. For example, we can sit back from the right distance and look at the city, glimpsing it in all its grandeur – in the totality of its being framed in a single glance. But, that is a perspective we can never achieve with the underground – it is marvelously un-seeable this way and therefore emblazes our imagination with fits of subterranean landscape speculation. Instead, we can only imagine a massive skeleton of transit tubes and secret chambers some how coming together to magically lift an entire city skyline up and over the horizon. But, in that secluded, restricted, privatized sub-city where old histories silently linger and whole populations of urban secrets are engraved in the spaces of formal and informal architecture – where military and urban planning join, or homeless camps and fall out shelters cross paths, that overlap of use is what I find particularly intriguing. It is the thriving unknown city that cannot be seen which aches for my attention. Apparently, the group has grown and now organizes “selected tours of remaining World War II bunkers and shelters in and around the city.” Now, bunker touring may be nothing new, but Berlin does offer quite a subtopian treat since close to “1,000 underground bunkers were built during the Nazi era” for which close to a third have survived. But, just as old bunkers are opened up to the intrigued throngs of global tourism new bunkers take their shape if only so far in the public’s imagination as rumours swirl over the government’s plan to build “a “new” 220-million-euro Interior Ministry premises in Moabit,” to - hypothetically - make up for the lack of a bunker in the old premises. I wonder, how much volumetric space is taken up in underground bunkers, how much air capacity exists trapped in these concrete structures? I've asked this before, but could we estimate exactly how much real estate, or in this case, air space, is devoted around the world to the underground? Nevertheless, if you are in Berlin, or are headed there, it would more than likely be unbelievably cool to go visit the Berlin Underworlds Association and tour the old vintage bunker cities of Nazi Germany. Hell, tell ‘em you’re a reporter for some crazy website called Subtopia and your researching for a book on post-military landscapes and spaces of global underground refuge and see what they say – who knows, they might open up some secret vaults just for you! You never know, I mean, I'm just saying - keep hope alive! Cool. If you do go, let me know how it is. Very curious. Go get lost down there, have fun! The tours are cool… literally and figuratively. They are “made for the masses”, and so cover only the coolest, most easily reached areas. But I’m sure that these people would really enjoy showing you more. They even dive underwater to check out areas which have been taken back over by nature. As for Tempelhof Airport… I’ve heard that it is quite interesting. Of course it was designed by Speer, and the tunneling is extensive. Unfortunately I’ve never made it. Berlin is cheap! Come on over! 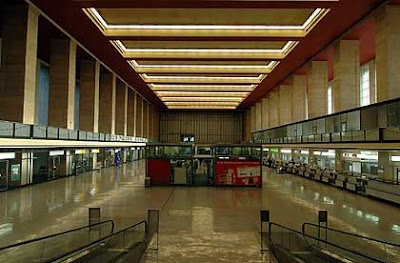 Tempelhof is designed by Ernst Sagebiel and not Albert Speer. I have been on the tour, and it was fantastic.